They say it only takes one time to get you hooked. 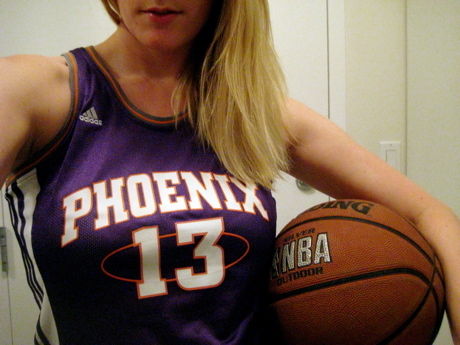 This couldn’t be more true of my love affair with the Phoenix Suns. Before last year, I hadn’t seen a live NBA game since the Grizzlies still hailed from Vancouver. And now, when it’s game night, nothing else matters. When I’m not updating the game status on my Twitter, I’m shouting and cheering at my computer screen. This girl’s taken a fast and furious ride down a slippery slope. 10. Hometown Pride – Being that Vancouver no longer has a team to call its own, it makes the most sense to cheer for a team whose star player calls Vancouver Island home. Though Steve Nash was born in South Africa, Victoria is where he was raised and the charity work he personally takes part in benefits communities in both Arizona and British Columbia. 9. I Got Game – The first time I picked up a basketball was in junior high and it’s a sport I’ve played off and on since. While it may surprise you, I can nail baskets with incredible ease. Being 5’9″ might have something to do with it. Somehow I believe this makes me a legit fan. 8. Tweet Me, Baby – Sports stars have long been admired from afar, but the Phoenix Suns have a strong online presence, allowing their fans to interact with each other and with some of the players. You can find Amar’e Stoudemire, Grant Hill, Steve Nash, Jason Richardson, Jared Dudley and coach Alvin Gentry on Twitter – each providing regular updates and sometimes running contests. In December the Suns held their first-ever Tweet-up prior to a game at the US Airways Center that was attended by Stoudemire. 7. Mind-Blowing Skills – With one of the NBA’s current best three-point shooters (Jared Dudley) and the best free-throw shooter (Steve Nash), every game is filled with moments where I ask myself “did that just happen?” One of this team’s greatest skills is their ball-handling ability with passing so fast you’ll miss it if you blink. 6. The Coach With The Most – When Alvin Gentry took the helm in May of 2009, he successfully turned the ship around and helped give the Phoenix Suns one of the best season starts they’ve seen in recent history. He knows his players, he knows the plays and he’s earned their respect. While his presence on the sideline may be intimidating to the best of them, I can’t help but laugh when I see Gentry stifling his Cheshire cat grin when the Suns are dominating on the court. 5. Dunks – Have you seen Amar’e Stoudemire dunk the ball? 4. The One And Only – Being a girl living in a city where hockey reigns supreme, it takes a bit of guts to buck the trend and cheer on basketball instead. But let’s be honest… hockey is for boys who are so afraid of getting hurt they pile on the padding. Basketball is for men who are tough enough to get bashed, banged and burned on the hardwood. 3. A Whole Lotta Heart – The Suns love the game they play. They work as a team, pass as a team, score as a team and none of them really monopolize the plays. And nothing beats a beaming smile from Dragic when he hits another three. 2. The Yummy Factor – I wouldn’t be a red-blooded female if I didn’t point out the obvious. Planet Orange is certainly home to some magically babelicious basketball players. I’d be more than happy to play towel girl to the bespectacled Stoudemire or Lou Amundson. Trust. Me. 1. It Takes A Village – It’s no secret that professional sports generate big bucks. While a lot of that money ends up lining executive suit pockets, the Phoenix Suns are one team that gives back to the very community that makes them who they are. The team has an actual, regulated charity board that’s been operating for more than two decades and now puts over $1 million dollars annually back into boys and girls’ clubs, food banks, sports programs and other worthy causes. I love a girl that love b-ball. As I am from Vic town too, Steve Nash always has a spot in my heart. Bring on the ball my friend. My 10th visit to Arizona is coming next month and I still haven’t attended a Suns game. Your post just might convince me to go. So when are we go hit up some hoops? Though something about the photo above make me think you’ll hustle me! @Tyler – This weekend! It’s supposed to be sunny on Saturday and Sunday… what do you have going on? It’s really a shame that the Grizzlies moved out of town…but they were never given a chance to succeed right from the get-go. I used to play quite a bit of bball but not as much lately. I played ball quite competitively in high school for about 5 years but really didn’t play much except a few games of pickup a couple times a year. I’ve definitely gotten rusty. If you get a gang together I’d love to play! Please let me know! You know I’m just kidding I think it’s totally rad that you’re a girl in Van who likes basketball. There aren’t many! Lookin’ good in that jersey! Pingback: A Vancouver Island Girl's Blog – Keira-anne.com by Vancouver Island Blogger Keira-Anne Mellis » Blog Archive » Sports Writer What? All things consderied, this is a first class post.